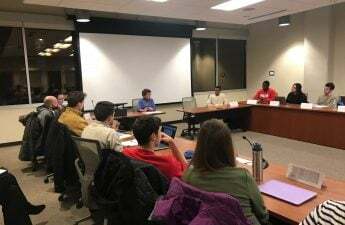 University of Wisconsin’s Associated Students of Madison Student Council met Wednesday to discuss the University Health Services budget which was unanimously voted against by the Student Services Finance Committee Monday. The budget was criticized as lacking transparency during the formulation process, as well as not properly meeting students mental health needs. Welsh encouraged members to get involved with the campaign at a grassroots level, specifically trying to create resources like counselors for marginalized identities. To put pressure on UHS to provide the funding needed for these services, Welsh said he has been meeting with student organizations that advocate for and provide mental health resources. He is also working with Vice Chancellor for Student Affairs Lori Reesor on forming a mental health task force as soon as possible. The group also unanimously voted for the Reserve Reduction and Student Activity Center Debt Repayment Authorization, which will save students $17 per semester, or $136 over four years. Student Services Finance Committee Chair Jeremy Swanson said it was rare to have the opportunity to save students money, calling it a “win-win situation” for students and the university. Additionally, with rising student concerns regarding sexual assaults, ASM Equity and Inclusion Committee started a conversation about implementing more emergency “blue buttons,” which are buttons located across campus that can be pressed to automatically call 911.